Revamp your little one's room with bright and vivid colors. Equipped with two spacious drawers with contoured silver handles, the Felix nightstand combines modern and country styles together for a charming appeal. Plank style drawer panels and bun-like feet make delightful final touches to a simple piece. Product frame is made of metal. Spot clean recommended. Minimal assembly required. Product made in Vietnam. Product made in United States. 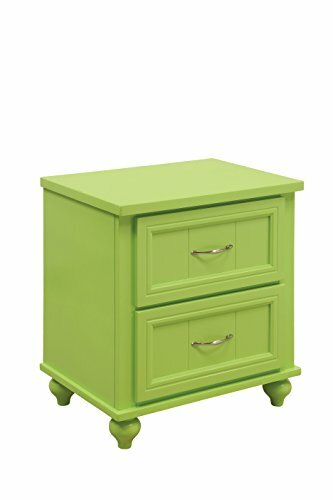 Once assembled, Nightstand measures 22 inches wide by 16 inches deep by 24 inches high. ; 30-days hassle-free replacement parts warranty. Pictures are for illustration purposes. All décor items are not included in this offer.